Festivals are a great opportunity for up and coming bands to grow their fan base and get noticed. While gigs tend to be populated by those who are already aware of your band, festivals give your band the chance to perform to people who have never heard your music before. There are countless festivals that are put on throughout the UK every year, but which ones should you be aiming for as a band looking to break through onto the music scene? In this guide, we have outlined the best festivals for up and coming bands to have in their sights. Branded as “The Festival for New Music”, this Brighton festival takes place in May and is the perfect opportunity to secure your first festival slot. The Great Escape is held across 35 different venues with a lineup that is exclusively made up of up and coming artists (with over 400 artists performing at last year’s festival). Whether you’re a grime MC, an electronic master or a good old fashioned guitar hero, The Great Escape is an absolutely fantastic way to get some tunes out to the masses. You’ll be playing alongside up-and-comers from across the globe, so it’s a great chance to reach out, connect and swap ideas with some great innovators in the international music scene. We do like to be beside the seaside. If The Great Escape sounds like your cup of tea, apply through the website here, the deadline for applications is the 11th of February 2019. Launched in 2007, BBC Introducing is a platform that supports up and coming artists of all genres. Every year they run stages at some of the UK’s biggest festivals, including Reading & Leeds, Glastonbury and Latitude. Some of the most popular names in the music industry have had help from BBC Introducing when they first started out, including Ed Sheeran, Catfish and the Bottlemen and George Ezra. Artists can upload two tracks a month to an online portal, which BBC Radio DJs will use to find music to play during BBC Introducing radio shows. The artists that are played are then reviewed by a panel of judges, who will then decide who will be featured on the various BBC Introducing stages. There’s a lot of steps to hitting it big with BBC Music Introducing. Unsurprisingly, you’ll be up against a lot of competition, but it’s definitely worth giving it a shot - the payoff could be incredible. If you’re thinking about throwing your hat into the ring, read more about the process here. Held across twenty live music venues throughout Camden, including icon spots like The Underworld, KOKO and Dingwalls, Camden Rocks is the perfect first festival for any up and coming rock band. The festival may not be until June next year, submissions for bands wanting to play are already open! When Camden Rocks aren’t organizing festivals they are putting on shows called “Camden Rocks Presents”, which are dedicated to showcasing the latest rising talents of the UK rock and metal scene. If your fans are coming from the denim and leather set and you’re looking to gain wider exposure, there’s nowhere better than playing Camden Town. Feel like it’s time you were rocking out in the heart of London’s alternative scene? Then fill out your application here. Rolling hills, sweeping valleys and beautiful lakes - Kendal Calling is a far cry from the dark alternative clubs of Camden Rocks. 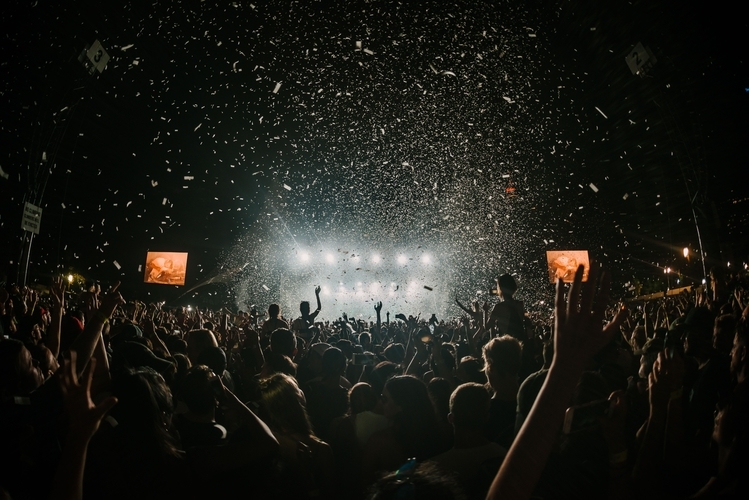 Located in Lowther Deer Park on the northeastern edge of the beautiful Lake District, the festival has developed quite the following, boasting artists such as The Libertines, Stereophonics and Kaiser Chiefs on their past lineups and drawing up to 25,000 people. Despite its ever-growing size and continually brilliant lineups, Kendal Calling also offers opportunities for smaller, lesser known bands to perform too. Any band can apply to play the festival, you’ll just need to send over an artist biography and picture, some social media links and at least one track for them to listen to. If you think your band has what it takes to rub shoulders with the likes of Noel Gallagher while taking in some seriously beautiful scenery, apply here. Applications open in early 2019. Bushstock takes pride in being the place to find the next big thing, with artists like Bastille, Hozier and Daughter having graced their lineups in the past. The festival has grown hugely in capacity since its inception in 2011 and is now held at the Shepherd's Bush Empire in West London. Despite their continual growth, Bushstock continues to support new talent and aims to nurture artists into the next big thing. If you think you’ve got what it takes, there are few festivals that encourage young, fresh bands like Bushstock does. You can apply through their website here. Alongside Kendal Calling, Green Man Festival is clearly going for ‘most beautiful location for a festival’. Taking place in the Brecon Beacons during August and featuring bands from a variety of different genres including indie, dance and folk, it’s a seriously wonderful place to listen to a huge variety of music. Every year Green Man runs the Green Man Rising competition. A variety of bands can enter to battle it out in the hopes of winning a slot on the main stage. To enter, simply submit a Soundcloud profile along with a photo and a short description of who you are. The twenty best submissions are sent to key tastemakers, who will select six bands to compete in the final competition, where bands will perform their music live in front of a panel of judges. The winner takes the main stage slot and the other five finalists will be given a slot on the festival’s Rising Stage. Entry for the competition opens in mid-2019, so keep your eyes on the website if you think your band could be next year’s Green Man Rising winner. Hopefully, this guide has given you some ideas as to which festivals are on the hunt for up-and-coming talent to showcase on their lineups. Now you just need a killer demo to show off your skills. Get in touch with Kore Studios, as one of the best recording studios in London, we can help you put together a tape that’s guaranteed to turn some heads.